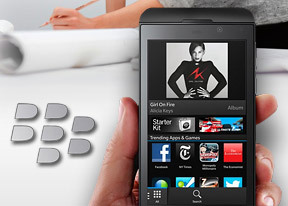 The BlackBerry Z10 covers the whole connectivity spectrum with four different versions. All of them have quad-band 2G GSM and 3G GSM (HSPA), but there are some key differences. The STL100-1 is the basic model - 2G, 3G with 21Mbps HSDPA and 5.76Mbps HSUPA. Then come STL100-2 and STL100-3 models, which add LTE to the mix (100Mbps down, 50Mbps up). The difference between the two are the 3G and 4G bands they support. Finally, the STL100-4 piles on CDMA with EV-DO Rev. A on top (though it supports fewer HSPA and LTE bands). Anyway, stores will offer the right model for your country and carrier, so you don't need to worry about it too much. Whichever model you get, you'd be all set for fast global connectivity. Local connectivity is fully featured as well. Dual-band Wi-Fi a/b/g/n handles local Internet connections and Bluetooth 4.0 handles accessories. There's also microUSB port for data connectivity with a computer and a standard microHDMI port for TV-Out. You don't need NFC to transfer tags either - the BlackBerry Z10 can create a QR code and read QR codes too, which is great for communicating with phones that don't have NFC. While we're here, we have to go over BlackBerry Link - the PC Suite for the Z10. The phone has the install file, just plug it in and install the app. Luckily, you don't need it for the USB data connection to work, you can simply enable mass storage mode from the settings and simply drag and drop files on your storage card. The PC Link has its advantages though - once everything is installed, the phone storage will appear as a drive on your computer. You don't even need the USB cable, the phone will appear as a network drive once it's on the same Wi-Fi network as the computer (you can disable this if you like). Link can schedule phone backups and automatic sync of content (both docs and multimedia). That's great with the Wi-Fi option - it will seamlessly sync your docs at work and then your music at home, you don't need to do anything. All that is great, but needing the app to install the right drivers is annoying. They didn't even install properly the first time around and we had to go through the Windows' Device Manager to get them to work. Link only supports dragging files from one place in the app to another (but you can use the computer's file browser option and save yourself the trouble). So, we added the folder with the documents and dragged them over through Link, but while doing so we noticed how long it took the app to scan a folder with four docs in it. Scanning phone content isn't speedy either. To top it all off, BlackBerry Link crashed a couple of times. iTunes and Zune are not the most well-liked apps around, and a buggy Link is not what we wanted to see. Okay, we got this off our chest. So in the end, mass storage is the way even if it only grants access to the microSD card and not the internal storage.. With some polishing Link might prove to be a superior alternative - just not right now. BlackBerry bragged about how good their browser is, so we ran a few benchmarks on it. At the moment, it's the top scorer at HTML5Test.com (which tests HTML5 compatibility), beating other mobile and even desktop browsers by a good margin.